If you crave simplicity in your space or in your day, but just don’t know where to start, this workshop will free you! We have more stuff coming at us then we can possibly deal with. 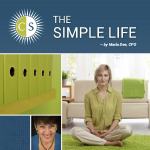 Marla & Kate have been consciously simplifying all areas of their lives for years and want to share with you! This workshop is limited to 9 students so please sign up soon. Saturday, September 22, 2018 | 12:30 p.m. to 4:00 p.m.
Are you ready to simplify your space, your day and your life? You don’t have to be a minimalist to simplify your life. Simplicity can come in many forms and has many gifts. We are excited to share fun & fabulous ways to simplify your space, your day, your commitments, your projects, your relationships and your stuff. – A simple MAP (Make a Plan) for the change you will make when you get home.